These are the best full-size SUVs for you if power and refinement take precedence over third-row-seat passenger comfort. Lots of folks are OK with that tradeoff: the Chevrolet Tahoe and Suburban account for more than 40 percent of the full-size SUV market. Add in sales numbers for the functionally identical GMC Yukon and Yukon XL, and parent-company General Motors’ market share rises to nearly 70 percent. These are traditional sport-utility vehicles, built like trucks, with their bodies attached to stand-alone frames. Traditional SUVs are a relative rare breed, replaced by the millions by lighter-weight crossover SUVs, which employ car-like “unibody” engineering in which the body and frame form a unified understructure. Crossovers can’t tow as much as a traditional SUV, but they tend to be more space-efficient, handle better, and get higher fuel economy. Still, there’s a market for the carrying capacity and rugged construction of a traditional SUV, and the segment remains highly profitable for automakers, helped in part by stable and affordable gas prices. Even with more stringent fuel-economy standards looming, don’t expect the established players to abandon this segment any time soon. Indeed, the competitive set has undergone something of a renaissance over the last few years. GM kicked it off when it redesigned the Tahoe, Suburban, Yukon, Yukon XL, and premium-class Cadillac Escalade for model-year 2015. Nissan followed with an all-new version of its flagship Armada for 2017. And Ford’s redesigned 2018 Expedition and Lincoln Navigator are in dealerships now. The main difference between the Tahoe and Suburban is their length. If you need to regularly carry six or more people, consider a Suburban first. It’s 2 feet longer than the Tahoe and rides a 14-inch-longer wheelbase (distance between the front and rear axles), resulting in more cargo volume and third-row passenger space. Just make sure a Suburban will fit in your garage before putting down a deposit. Waiting for the 2019 models probably isn’t worth it. Redesigned versions of the Tahoe and Suburban are on tap for model-year 2020 or 2021, so don’t expect GM to make notable changes for model-year 2019. Buy a 2018 Tahoe or Suburban if you’ve believed they could use a bit more attitude; Chevy thought so, too. Both are available with a new, sport-themed “Rally Sport Truck” option package that includes more aggressive styling cues and firmer suspension tuning. Tahoe models so equipped are also eligible for a new Performance Package that includes a larger, more powerful engine, upgraded transmission, and a performance suspension calibrated for even sharper handling. Trim-level designations for both vehicles carry over for 2018: base LS, volume-selling LT, and top-line Premier. A V-8 engine and rear-wheel drive are standard across the board. Optional is full-time four-wheel drive (4WD) that can be left engaged on dry pavement and includes a low-range gear set for off-road use. Styling: Today’s Tahoe and Suburban were last redesigned for model-year 2015, an age that made them ripe for a model-year-’18 facelift. Aside from the unique styling of the RST Package, that didn’t happen. Satin Steel Metallic replaces Champagne Silver metallic on the list of available paint colors, however. And all models gain standard LED daytime running lights; these were previously standard only on the Premier trim. Carryover styling elements include an expansive horizontal grille with sweeping headlights that wrap around to the front quarter panels in an effort to make these vehicles look more aerodynamic than they really are. The rest of the design is straight-up SUV: big, blocky, and in-your-face. 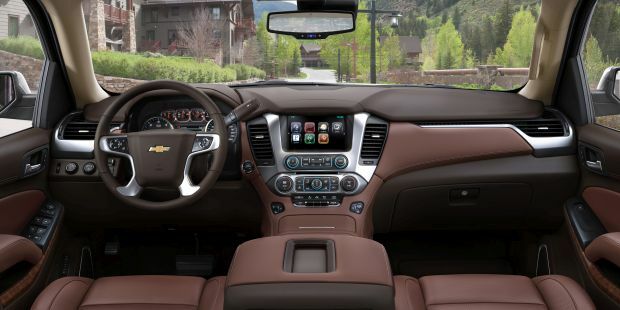 Inside, Tahoe and Suburban retain their user-friendly instrumentation and controls, abetted by a comprehensive gauge cluster and Chevrolet’s intuitive MyLink infotainment system. All models include support for Apple CarPlay and Google Android Auto, as well as 4G LTE data through GM’s OnStar service, which transforms the vehicle into a rolling WiFi hotspot. Interior storage is exceptional with a large glovebox, door pockets, and an available center console bin that can accommodate a reasonably sized laptop. Most Tahoe and Suburban models seat seven or eight. A nine-passenger configuration is available if you’re willing to sacrifice some of that massive interior storage capacity. The driver, outboard front-passenger, and second-row occupants have sufficient headroom and legroom. While the available second-row captain’s chairs have more comfortable cushions than the standard three-across bench seat, they don’t have a very wide range of adjustment – try before you buy. The third row is where things become problematic. In an effort to save costs, GM outfitted both the Tahoe and Suburban with a solid-axle rear suspension as opposed to the more sophisticated independent setups found on the Expedition or Armada. The third-row seats have to sit above this bulky component, which dramatically cuts into legroom and forces occupants into an uncomfortable knees-up seating position. At least the third-row seatbacks fold flush with the cargo floor. Mechanical: Powertrain refinement is where Tahoe and Suburban shine. All versions come standard with a 5.3-liter V-8 engine that produces 355 horsepower and 383 pound-feet of torque. It would be nice if GM saw fit to equip these large SUVs with the excellent 8-speed automatic transmission that’s available on Chevy’s own Silverado 1500 pickup truck. However, the 6-speed automatic used in the Tahoe and Suburban is a smooth operator, and there are few instances in which you’re left wanting for those extra gears. The optional Performance Package for Tahoes equipped with the RST package includes the 6.2-liter V-8 engine from the Cadillac Escalade and GMC Yukon Denali. It produces 420 horsepower and 460 pound-feet of torque and teams with a new 10-speed automatic transmission. Other RST enhancements available for both the Tahoe and Suburban include 22-inch wheels, upgraded brake rotors and calipers, and a high-flow performance exhaust system. From behind the wheel, you won’t mistake the Tahoe or Suburban for anything but the large trucks they are. They’re not nimble, of course, handle with a brawny confidence and are excellent cross-country cruisers, aided by the extra isolation from the road provided by their body-on-frame construction. You’ll experience some proposing over wavy pavement, but ride quality is otherwise laudable. We haven’t yet tested an RST version, but are curious to weigh promised improvements in handling against potential compromises to ride quality. Features: Tahoe and Suburban see a few feature updates for 2018. As mentioned, LED daytime running lights are now standard on all models. GM has also developed a tire-fill alert system that sounds the horn when your tires have been inflated to the proper pressure – Nissan has offered a similar system on many of its products for years. With few minor exceptions, Tahoe and Suburban share standard and optional equipment. Included on the LS are a rearview camera, MyLink infotainment, WiFi hotspot, rear-obstacle detection, 10-way power driver’s seat, fold-flat second and third-row seats, remote engine start, and three-zone automatic climate control. Upgrading to the LT nets leather upholstery, heated front seats, automatic high-beam headlights, Bose-brand audio system, forward-collision warning, automatic emergency braking, and automatic steering correction should you wander from your lane. Premier models gain high-intensity discharge (HID) headlights, front-obstacle detection, power tilt and telescopic steering column, ventilated front seats with 12-way power adjustment, power folding third-row seatbacks, power release second-row seats, and GM’s Magnetic Ride Control suspension with 20-inch wheels (up from standard 18s). Model-year 2018 base prices increase slightly for the Suburban, by about $150-$250. But they decrease by similar amounts for the Tahoe. Base prices listed here include Chevrolet’s $1,295 destination fee. With rear-drive, a 2018 Tahoe LS starts at $48,745, an LT at $53,875, and Premier at $63,425. 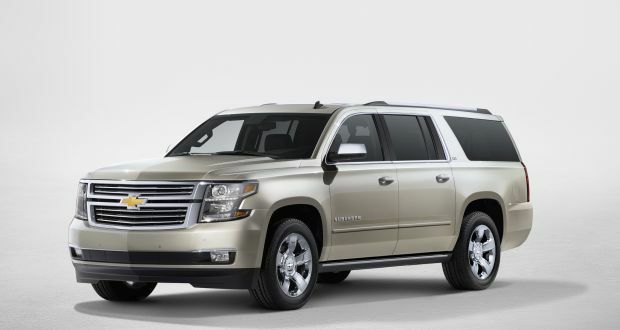 The corresponding Suburban LS begins at $51,445, the LT at $56,575, and Premier at $66,125. Four-wheel drive is a $3,000 add-on for all models. Options are mostly shared between Tahoe and Suburban, and are generally unchanged for model-year 2018, although prices were not announced in time for this review. Listed parenthetically is the option’s 2017 price; expect little if any change for model-year ’18. LS and LT models offer a ($780) Max Trailering Package that includes a revised rear axle ratio, trailer brake controller, and upgraded suspension with air leveling. The LS Enhanced Driver Alert Package ($695) for the LS nets forward-collision alert, automatic emergency braking, self-correcting steering if you wander from your lane, power-adjustable pedals, and adaptive headlights. The All-Season Package ($3,080) includes the Max Trailering Package, 20-inch wheels (up from standard 18s), and specific exterior trim. Moving to the LT opens access to the Luxury Package ($2,995), which adds pushbutton ignition, a power release mechanism for the second-row seats, a power-folding third-row, driver-seat memory, heated steering wheel, power tilt and telescopic steering column, hands-free power rear liftgate, front- and rear-obstacle detection, and blind-spot alert with rear cross-traffic detection. The Texas Edition Package includes all this equipment, along with a multitude of badging for an extra $250. Models so equipped are sold only in Texas. The LT Z71 Off-Road Package ($1,850) adds off-road suspension tuning and tires, underbody skid plates, unique exterior trim, fog lights, front- and rear-obstacle detection, hill-descent control, and a high-capacity air cleaner. The LT Signature Package ($6,770) includes chrome wheels and exterior trim. Blackout exterior trim is included in the Midnight Edition Package ($1,835). The Sun, Entertainment, and Destinations Package ($2,885-$3,480) is available on the LT and Premier and includes imbedded navigation, power sunroof, and rear Blu-ray entertainment system. Pricing for the Tahoe RST Package was not available in time for this report. No Tahoe nor Suburban is inexpensive, but our vote for the best value goes to a 4WD Suburban LT with Luxury Package, which will check in at around $60,000. EPA fuel-economy ratings for the 2018 Tahoe and Suburban continue to be at the top of the competitive set. This is impressive, considering these vehicles are big and heavy, not particularly aerodynamic, and have V-8 engines. 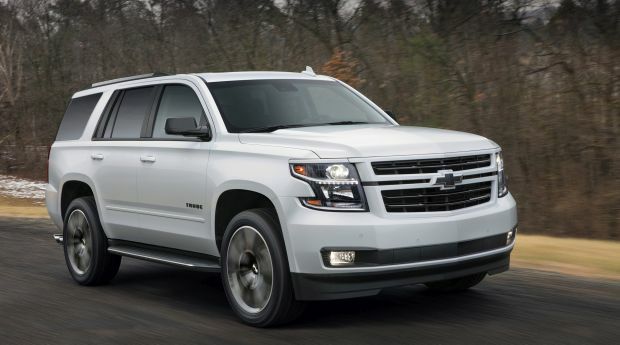 With rear-wheel drive, the 5.3-liter V-8 and 6-speed automatic transmission, both Tahoe and Suburban rate 16/23/19 mpg city/highway/combined. Four-wheel drive models rate 16/22/18 mpg. The new 6.2-liter-V-8 and 10-speed-automatic combination in the Tahoe RST rates 14/23/17 mpg with rear-wheel drive and 14/22/17 with 4WD. All models use regular-grade 87-octane gasoline, and some 5.3-liter engines are capable of using E85 ethanol-blended fuel. In years past, full-size SUVs would have a lifespan mirroring that of the large pickup trucks upon which they were based. New design generations would appear roughly every 8-10 years, with freshening somewhere in between. The surge in popularity of large pickups over the last decade is resulting in quicker turnover. For example, the Ford F-150 debuted for model-year 2015, is getting a major update for 2018, and will likely be completely redesigned for 2020 or 2021. Tahoe and Suburban are on a similar path, albeit without the significant freshening that should have happened for 2018. Expect the next generation of these full-size SUVs to debut for 2020 or 2021. The new models may be smaller and lighter than the ones they will replace. Fuel-economy considerations could mean the end of the V-8 engine in favor of a turbocharged V-6, similar to what Ford is doing with its new Expedition. Nissan Armada, which transitioned to Nissan’s international Patrol platform for model-year 2017, gaining some off-road ability and a bit of upscale cred, but losing too much third-row passenger space and all-seats-in-place cargo volume to remain a viable family seven- or eight-seater; Toyota Sequoia, which admittedly beats the GM SUVs for third-row space, but shows its age (the design dates to model-year 2007) and rides and handles with less aplomb. Ford Expedition and its extended-length Suburban-fighter, the Expedition EL, which use twin-turbo V-6 power to meet the Chevy’s for performance and the room freed up by an independent rear suspension to beat them for third-row accommodations; Dodge Durango, a great choice if you don’t need as much mass as the big Chevy or Ford SUVs. It’s a unibody crossover, but with rear-wheel drive, available Hemi V-8, and an independent rear suspension – adding up to a still-roomy but more-wieldy SUV.